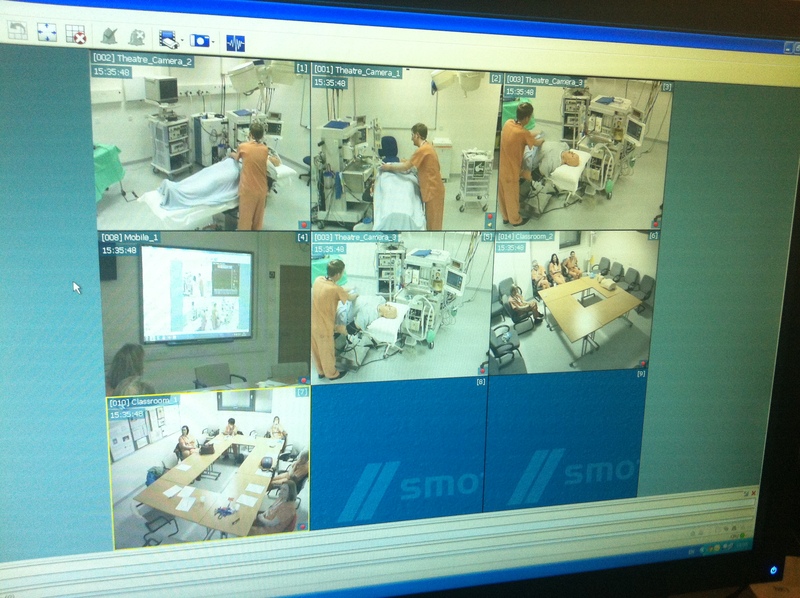 So on 15th December 2014, we presented the first version of the Eidolon project as an intimate performance at the Scottish Centre for Simulation and Clinical Human Factors (SCSC), at the Forth Valley Royal Hospital, Larbert. A huge thanks goes to the staff at SCSC, the performers and all the audience members who participated. The performance ran from 2.00-4.30, and after a short introductory briefing in Training Room 1, the audience was split into two groups, who we then set off to have slightly difference experiences and versions of the performance. Group 1 were the first to get into scrubs and while waiting for the simulation to begin they were told the story of L’Inconnue de la Seine and Resusci Anne. Meanwhile, Group 2, who were still in Training Room 1, watched on-screen a live scripted dialogue “Manichat” between a medic/technician (the actor Stanley Pattison) and the manikin (Pauline Goldsmith). 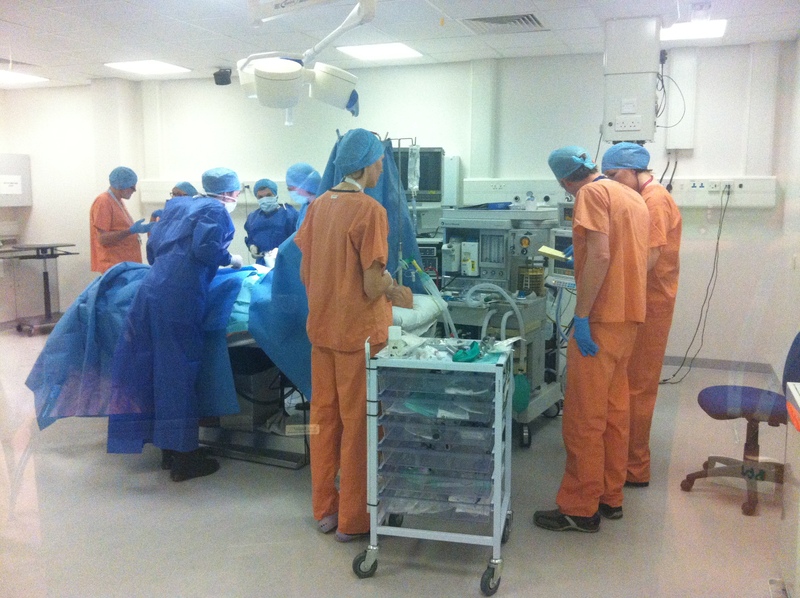 Group 1 were now ready to participate in a simulation, in this case a femoral hernia repair. Each member of Group 1 was given a role such as Anaesthetic Assistant or Trainee, Surgical Assistant, Scrub Nurse and Floor Nurse. At the end of the simulation Group 1 went back to the Training Rooms and Group 2, got their scrubs on a went into “theatre” to complete the femoral hernia repair, again assigned roles of Anaesthetic Assistant or Trainee, Surgical Assistant, Scrub Nurse and Floor Nurse. 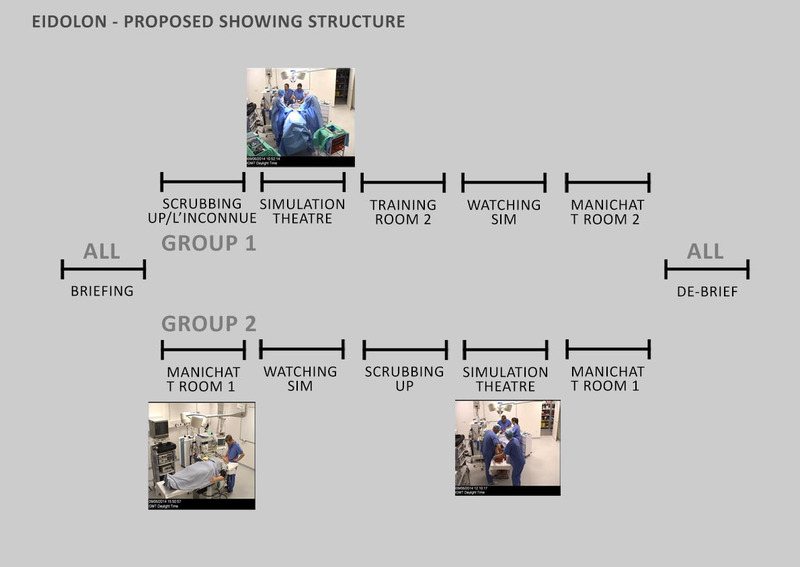 At the end of the simulation both groups went back to the Training Rooms where they watched another on-screen live scripted dialogue “Manichat” between a medic/technician (the actor Stanley Pattison) and the manikin (Pauline Goldsmith). This was the second manichat that Group 2 had seen and the first for Group 1. To finish the performance we held a De-brief, with mince pies, tea and coffee (well it was just before Christmas!) back in Training Room 1, bringing together all of the audience, performers and staff. The experience generated lots of great discussion; how the manikin changed from subject to object during the simulation, whether the manichat was live or pre-recorded (and the observation from participants, who found the manikin a bit depressed, long suffering, moaning that she could always be switched off! ), how calm the simulation scenarios were (even when the situation became more serious), the definition of roles within the medical theatre, the dignity of the body (living or dead), the audience suspension of disbelief i.e. the manikin appearing to be not just a dummy, but an actual person, the potential of other camera views, such as close ups, and the responsibility and terror of making mistakes (in all types of theatre! ).